Cream of the Crop! MC seem to be one of the latest craze for contemporary romance writers. I'm not complaining I love bikers! These bad boys appeal to the good girl in me:) In the past few months I have read a lot of them and I have to say..this book has risen to the top. 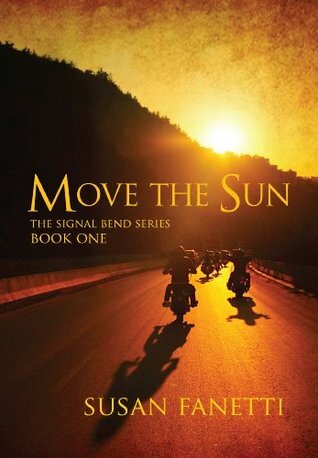 Susan Fanetti is a new to me author and if she crafts all her books with the eye to details like Move the Sun then she is fast moving up my favorite author list. The characters in this novel are so fully dimensional that you feel absolutely everything they are feeling. Our heroine Lilli is amazing she is so different from most of the "old ladies" in other MC books. Lilli is ex military, kickass, vengeance seeking woman who comes from a background where she should be a broken shell but her strength of character overcomes her tragedies. Just a wonderful female lead! Isaac...first I have to say I loved that he had a name and not a nickname. It was refreshing. Isaac though not as fully dimensional as Lilli still shows different sides to his personality, he is well read, tough, sensible with a hot temper...I mean what is not to love. SF also created reality with the physical appearance of our male characters, they are long haired, long bearded big tough men exactly what you would expect if you ran across them in RL. The plot is edgy, gritty and has some dark places and is also refreshingly different. Don't expect a Disney story if you are picking up this book...it touches the dark side of life and isn't afraid to look into the shadows. I don't want to say much about the plot because spoilers would ruin it . I just want to say...it was amazing. This book does have an ending of sorts but also has somewhat of a cliffhanger because the story does continue in book 2.